We have always been fascinated by Elina’s work, and her interest in understanding the natural world, specifically what water is. We are very excited to share with you a little insight in the artist herself, what it is she does and how she keeps her art relevant. My grandfather was an avid photographer, some of my childhood memories are related to his hobby, and the sound of shutter was so pleasant, that it became one of my favorites. I was good at most of the subjects in school but it was difficult to find a direction; I loved science, art and languages, but I decided to study philosophy. I was particularly interested in Ancient Greek Philosophy but the practical side of me won and I got Bachelors and Masters degrees in French language, culture and translation. The thought of becoming an artist germinated for a long time. Nobody in my family is an artist, so it wasn't obvious and easy to choose this route. But my parents always insisted on the importance of education and working hard and gave me the freedom to choose, so I grew up being determined and persistent. I also had a role model, someone to admire in every stage of my life - a teacher, a friend or an artist. However, the most important, yet the hardest thing was to believe and trust myself that I am an artist. I am not sure I remember what was the first but from the period when it could have been the first I loved a Latvian painter Kurts Fridrihsons whose abstractions showed the world in a very sensitive and delicate way. And Salvador Dali as he was taking me to an incredible imaginary world. Some time later, I witnessed paintings by Mark Rothko and sat in front of them for hours; they are meditative and inspiring. My biggest inspiration are long walks in nature, meditation and running. They allow me to clear the mind, get attuned to my senses and trust my art. Working is also a way to get inspired; when working on one piece, I often get ideas on what to make next. When something does not work out, I either put it aside for a while and return to it with a fresh look or work it through. I use my intuition how to proceed. I love having my own space dedicated to art, unfortunately I more often don't have my own studio than I do. Nevertheless, I have learnt to work all the time. I do something for his art every day - may it be writing, thinking or making - it is not always about creating a masterpiece a day, it is hard work, a never-ending applications process and accepting that rejection is part of it. I read an interesting article where a young writer Kim Liao explains why one should aim for 100 rejections a year. If you work that hard, you might as well get some acceptances too, she says. I keep a journal/sketch book that I have always with me. "Framing Effect" is a big installation piece (about 2.25 m by 3.65 m) that slightly changes every time I show it. 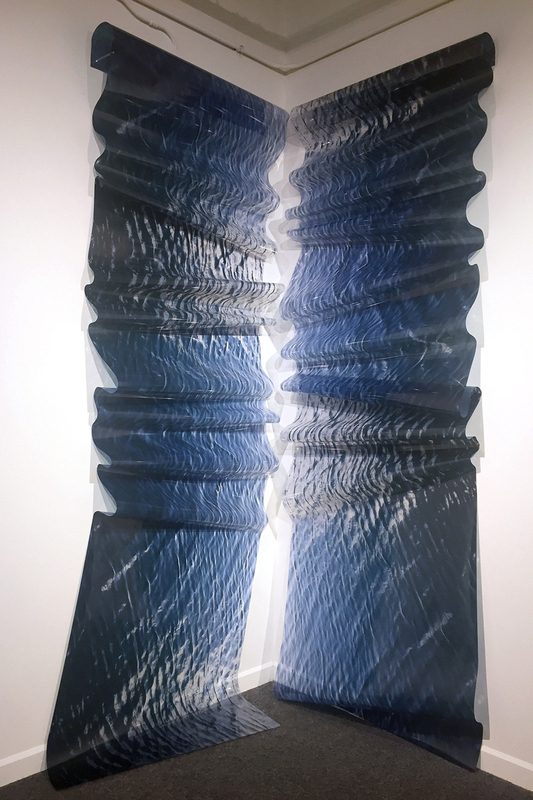 I love it because it is never exactly the same, like the main subject of my art - water, and because it is the first piece I made in such a large scale and also the first three dimensional piece. I will be showing even larger pieces at my upcoming solo show at the Latvian Museum of Photography this July. Diana Markosian's "Doud, age 11. Wolfsburg, Germany, 2017" from Magnum Photos 6x6 collection and a special edition of Julie Weber's book "Remnants". The book is a portfolio of 12 unbound sheets: on one side, twelve individual images are presented, and on the other side, the twelve pieces can be arranged to form a single, composite image. It came with a unique print. As from the artsnug collection, I would choose a cyanotype from Alice Serafino, a gold leaf collage from Andrew J Millar, a star constellation from Sabrina Kaici and a piece by Victoria Young Jamieson.